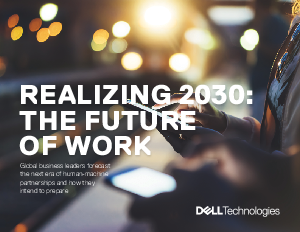 Dell Technologies recently teamed-up with Institute for the Future (IFTF) and 20 experts from around the world to project into the future, forecast how emerging technologies - such as Artificial Intelligence (AI) and Internet of Things (IoT) - will reshape how we live and work by 2030, and gather insights that will help businesses navigate the coming decade. The experts concluded we’re on the cusp of the next era of human-machine partnerships. Learn more about Dell solutions powered by Intel®.